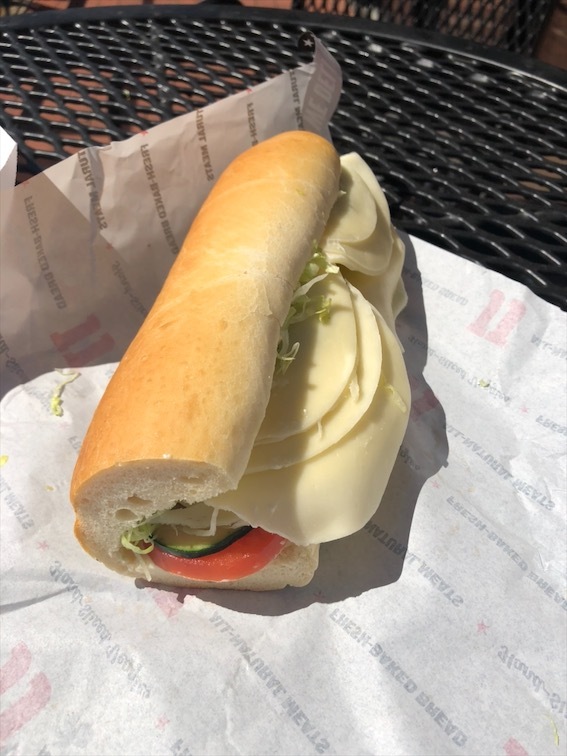 Right across the street from NC State’s campus and in a prime location for Hillsborough Street business, Jimmy John's is an ideal pit stop for a lunch break, a quick afternoon snack, and for this week’s Tasty Tuesday! I opened the door to a team of eager employees spread out between the kitchen, the register and phones. There was a small crowd of customers enjoying the indoor seating and their meals. Both phone lines were ringing and answered by delivery riders who were still wearing their matching red helmets. Their uniforms boast their bold and humorous marketing slogan for “Freaky Fresh, Freaky Fast” service. 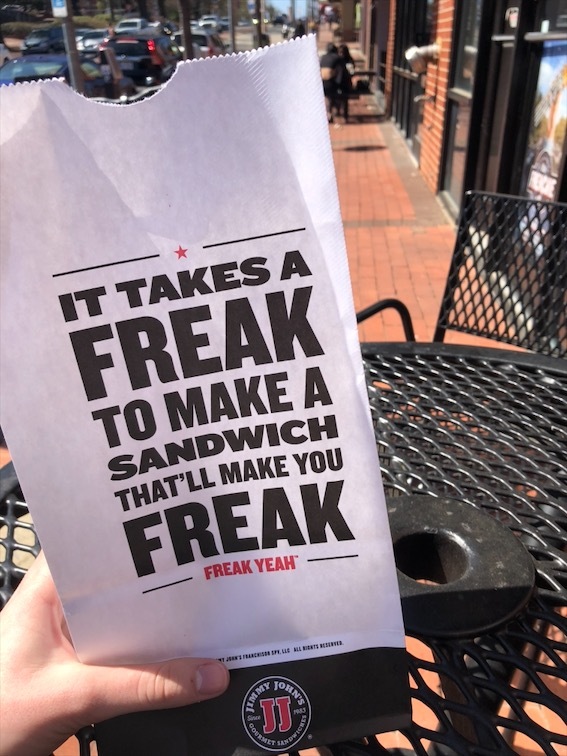 Jimmy John’s menu offers endless specialty and custom sandwich options to be paired with a choice of your selection of “Jimmy Chips” and a Coke. I ordered the #13 Gourmet Veggie Club from their “Favorites” menu with a side of BBQ chips and a refreshing Diet Coke. Soft Italian bread piled with crispy lettuce, juicy tomatoes and a generous layer of double provolone cheese paired with cucumber, avocado and a mayo spread. These “Freaky Fresh” ingredients made for an energizing combination that left me satisfied. This sandwich was the perfect vegetarian option for a quick lunch break or a light snack to power through the last half of the day. I was impressed that even with the rush of phone orders, the kitchen was quick to attend to the customers in the restaurant as well. They were friendly and had my order out quickly. It took me longer to decide between all the exciting options than it did for them to make my sandwich. I got to enjoy my lunch at a cute little patio table out front in the beautiful sunny weather. As I was finishing up, both uniformed delivery staff members had unlocked their bikes and set off on their deliveries. Jimmy John's is a quick, easy and satisfying lunch stop with humorous branding that makes it a stand out destination on Hillsborough Street. I will definitely be frequenting Jimmy John's more often!